Working on a construction site comes with a fair share of risks. Working at heights leads to slips and falls, bad wiring is the cause of many accidents involving electricity, moving and falling objects pose a risk of crushing injuries, workers’ respiratory tract can be affected by asbestos or toxic airborne fibers, moving vehicles like dumper trucks, diggers and loaders are dangerous to maneuver and are often the cause of on-site accidents in short, the list of things that can go wrong and cause serious injury or even death seems to be endless. Recent times have seen an enormous push for improved safety for construction workers. Many companies are making safety a priority, ensuring that all employees are fully aware of the risks they take daily and ensuring proper training is conducted on sites. Safety regulators in many countries are also putting in place regulations to make sure that proper processes and measures are taken before starting dangerous activities. For instance, permits to work need to be processed and duly approved before starting dangerous activities such as excavation, lifting or welding. While the intent of these regulations is good, enormous amounts of paper forms are being generated on a daily basis. Incidents and accidents are recorded on paper and responsibilities assessed, but it is difficult to assess how much of an impact these paper processes have on safety. Emerging technologies – mobile, wearable, IOT, localization – are starting to be deployed on construction sites, replacing paper documentation, and they could play an important role in raising safety standards. Affordable mobile devices combined with cloud and mobile applications make it possible to fully digitize all safety processes. Take safety permits to work, for instance: checklists can be completed on mobile devices and approvals completed in real time. 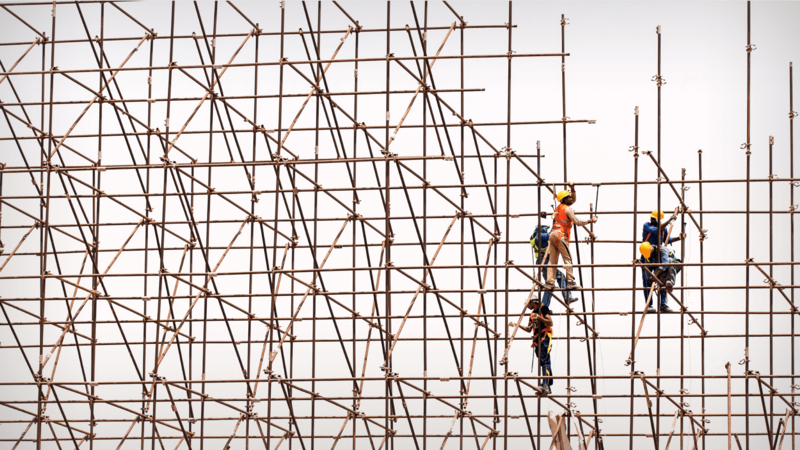 Supposing a worker is due to carry out hazardous work at a large height: in order to receive a permit to work, he must progress through a series of safety checks on the software platform. Only when the worker has progressed through the various software safety checks, will he be issued with a permit to work. All the processed information is digitally shared with co-workers, supervisors and management. The benefits of this innovation include increased productivity, smarter output, and the ability to detect conflicting activities in real time. In many cases, it is new or little trained staff who end up having an accident and the importance of continuous training cannot be underestimated. Training is usually conducted on-site, in the morning before work begins. An interesting way to increase awareness and impart knowledge is to share best practices: every time a good practice is observed, it is reported on mobile devices and it can be shared with colleagues during the next training session. Instead of only being instructed on what not to do, best practices are both encouraged and shared with the team to further incentivize safe conduct. Wearables could prove invaluable for workers carrying out a hazardous job as their environment could be carefully tracked and monitored. Red flags such as lack of movement, heat, gas, etc. could be detected by such wearables. Close-by co-workers as well as management and even emergency services could automatically be alerted if a problem is detected. In the unfortunate event of an accident, workers will be confident that the wearables will immediately alert their superiors or co-workers, greatly reducing the time required to get medical attention and thus considerably increasing his chances of recovery and even survival. Mobile devices and smart wearables combined with emerging localisation technology could play a vital role. When a major incident happens, the ability to immediately locate all workers potentially impacted, as well as to identify safety resources is critical. Devices could inform supervisors, close-by co-workers as well as management immediately after an accident has occurred. Accident victims will be found at once and bystanders will be in a position to access and follow emergency procedures. While this advancement is exciting and can help improve safety, companies should ensure that any tracking measures put in place only apply during working hours. The digitization of processes, tracking of dangerous activities, connection of IOT for equipment, reporting of incidents, etc. allows the collection of a vast amount of data on safety that can subsequently be analyzed. Correlations can be derived. For instance, trends that may lead to the malfunction of tools or accidents for workers can be identified early and alerted of and corrective action can be suggested for the prevention of accidents or tool malfunction. An incorrect setting on a piece of equipment or a malfunction can be detected and the appropriate personnel can be alerted. Mobile safety technology can help the construction industry make huge strides in raising safety standards and preventing the occurrence of accidents. While there still may be a long way to go to achieve the complete eradication of construction accidents, there is hope. Increasingly, advancements in software and technology are contributing towards the further improvement and implementation of safety on site. One would hope that in the near future, all construction companies will make use thereof and digitize the entire construction process for the sake of the safety of their staff.